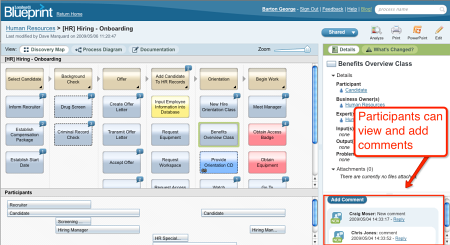 Process Improvement is Everbody’s Business – Blueprint Spring ’09 goes Live! One of the advantages of a cloud-based application is that product improvements can be streamed to customers in frequent and regular intervals. To make Blueprint available to an even wider audience, we have introduced a “Participant” view. Unlike the “Author” view that allows users to create, edit and comment on processes, the participant view presents the user with read-only views that they can annotate and comment on. The number bubbles on the boxes let viewers know the number of comments on each step. The new participant licenses are perfect for taking Blueprint beyond your organizational walls to partners and suppliers who are integral to your processes and can give you valuable feedback on how they are actually working, or not working, as the case may be. The participant view also works well within your org for those people who may not have the time to map or edit a process but have the time and knowledge to give feedback. Although Blueprint has featured built-in IM chat since its beginning, we have borrowed more from the world of Social Media for the latest release. As soon as you login, you’ll notice that like Facebook, you are presented with a list of those processes that you are associated with that have been published, changed or commented on. This new Activity Feed helps you to discover relationships between what you do and the rest of the company. Now you’ll know when something changes two steps upstream from you that will affect your job, or that the person in the next building over does something similar that you leverage. With Saturday’s release, now more than ever, Blueprint takes the practice of process from the hands of the few and spreads it through out your and your partners’ organizations. It in effect becomes the central communication platform for collecting, sharing and improving how work gets done in your organization. To learn more about this new release, check out Blueprint Product Manager Dave Marquard’s details of the new features or watch the 38-minute webinar and Q&A. This entry was posted on Tuesday, May 19th, 2009 at 10:52 am and is filed under Uncategorized. You can follow any responses to this entry through the RSS 2.0 feed. You can leave a response, or trackback from your own site. 2 Responses to Process Improvement is Everbody’s Business – Blueprint Spring ’09 goes Live!